Sunlight provides the energy trees need to rip apart molecules of water and carbon dioxide, so they can then be rearranged into sugars. The tree can then store these sugars until they’re needed for growth or maintenance. But some trees require more sunlight than others. Young oaks and magnolias, for example, require only the dappled light penetrating the forest canopy to grow, at least during their early years. But others, including, sycamores, red cedars and cherry trees only thrive in relatively sunny locations. Deprived of sufficient sunlight, these trees will struggle to survive. Quaking aspens are another species that depends heavily on the sun. In fact, like a number of other smooth-barked trees, aspens even possess chlorophyll – the green compound responsible for the capturing sunlight and performing the molecular magic we call photosynthesis – in the smooth bark of their trunks and branches. This enables the trees to capture some of the sunlight that many other trees would miss. These types of adaptations, which maximizes a tree’s ability to collect sunlight, are characteristic of many trees known as pioneer species. Forests are not static features of the landscape; they change over time. This is most obviously illustrated by the way the canopy climbs toward the sky. But the forest’s changing composition also changes over time. Pioneers are the first species to colonize areas left barren by fire, mudslide, avalanche or clear-cut. And because these habitats are bathed in sunlight, pioneers thrive in the early history of most forests. But as forest age, they become increasingly shaded. The canopies of the pioneers shade the forest floor below. This makes it difficult for new pioneers to germinate. But the shade-tolerant counterparts to pioneer species – known as climax species – soon move in set up shop. Most pioneer species have evolved extremely rapid growth rates. This ensures that their canopies remain above those of the invading climax species, which allows the pioneers to remain exposed to the sun’s rays. Aspens may put on 2 feet of height each year while they are young, some other pioneers grow even faster. But this rapid growth comes at a cost. 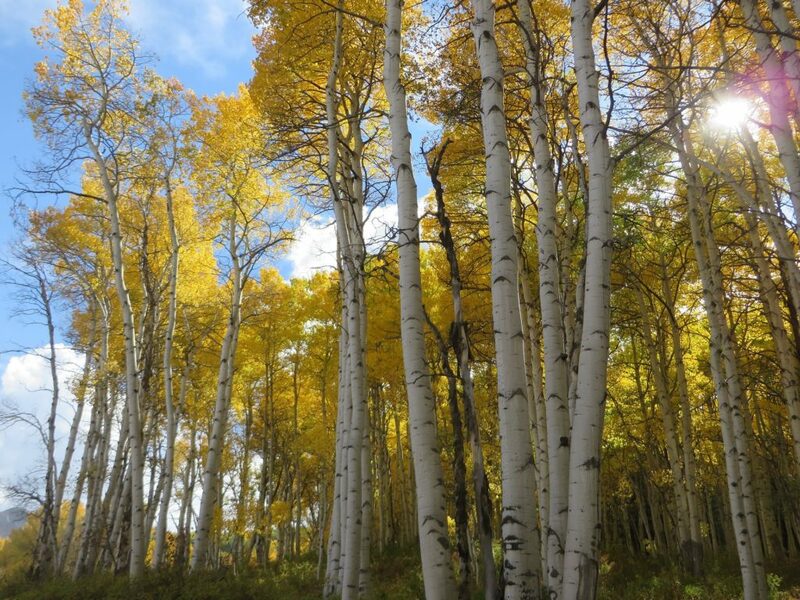 Aspens – and most other pioneers — live relatively short lives. Of course, lifespan is a relative term. Healthy aspens easily outlive humans, but they never survive for thousands of years, as some pines and sequoias are capable of doing. One-hundred-fifty years marks a healthy lifespan for an aspen; 200-year-old specimens are quite rare. But this isn’t a big problem for pioneer species. After all, the habitat will have changed drastically by the time the trees have been around for a century or two. At some point, it will have stopped being suitable for these sun-loving trees anyway. So, pioneer species embrace a live fast, die young evolutionary strategy. They mature as quickly as possible and then cast a ton of seeds into the wind. With luck, some of these seeds will land in entirely new sun-drenched and disturbed habitats, where the process will begin anew. Some plants and trees are noteworthy for having particularly resilient seeds. Oak seeds (acorns) typically remain viable even after being collected and cached by squirrels and jays. River birch seeds may float down rivers and streams for miles until they wash up somewhere conducive to germination. For that matter, coconuts often float across the ocean only to germinate once they reach some faraway shore. And many seeds remain viable for unthinkable lengths of time. In 2005, Israeli scientists planted a 2,000-year-old date palm seed, collected from an ancient military outpost. It not only germinated, it thrived. But a few years later, Russian scientists achieved similar success, only this time the seed in question was a 32,000-year-old seed retrieved from an ancient Arctic ground squirrel’s burrow. But aspen seeds are at the opposite side of the spectrum, and they lack such resilience. Tiny and lightweight, aspen seeds are typically borne in clumps of 10 or so. They’re usually surrounded by a ball of cotton-like fibers which helps catch the wind and keep the seeds aloft for great distances. But while aspen seeds often spread far and wide, they only germinate under a very narrow range of conditions. They must land in bare moist soil to germinate, and they must do so within the tiny window of time during which they remain viable. The overwhelming majority accomplish nothing at all. Even commercial tree growers find the seeds challenging – most grow their stock from cuttings. This is somewhat unusual for a pioneer species. Their very claim to fame is showing up first and getting started quicker than their competitors can. They are the early bird enjoying a delicious worm. But it turns out that aspens don’t rely entirely on seeds to perpetuate their species. 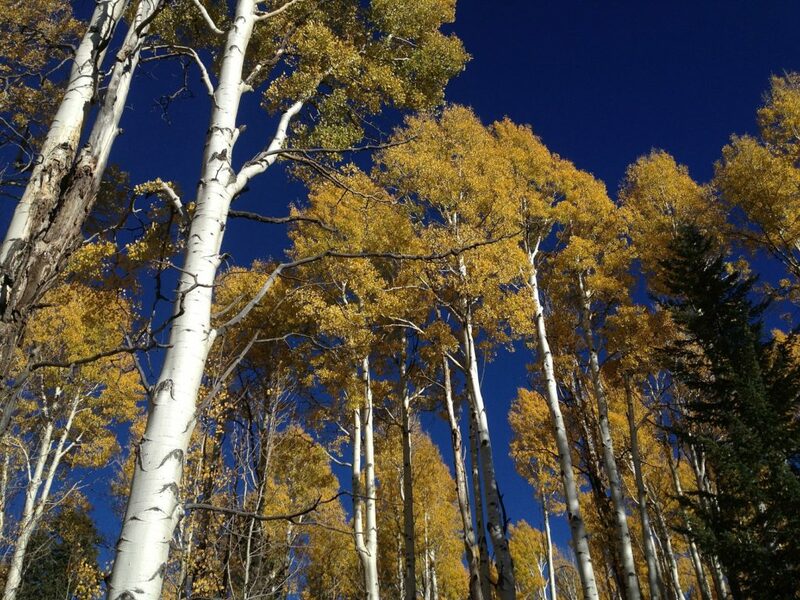 Aspens, it turns out, have figured out a way of hitting the reset button and cheating death. Aspen seeds are the result of sexual reproduction. The pollen from male flowers fertilizes the ova located within female flowers, which causes the ova to transform into a seed. But they also reproduce asexually, through a process botanists call vegetative propagation. This occurs when they birth new stems from their existing root system. This is a pretty common phenomenon among plants of various species. Stress – be it caused by illness, insufficient water or overly aggressive pruning – can cause a tree’s root system to produce a bevy of new stems (trunks). This way, if the original stem dies, one or more of these new stems can continue to survive. These individual stems – which you would normally think of as individual trees – are all genetically identical. So, when you are looking at a grove of aspen trees, you are often seeing a collection of stems that represent a single organism, rather than multiple organisms. This also has important implications for the way we think about the lifespans of aspen trees. The 100-odd-year lifespan discussed earlier is accurate. Except for one small detail. Instead of saying that aspens live for a century or two, we should have replaced the word “aspen” with “stem.” The aspen stems come and go in relatively quick fashion, but the greater organism – including, most importantly, the root mass – lives for much longer than this. Different organisms evolve different life strategies to adapt to their surroundings. Frogs and leopard seals take very different approaches to reproduction, as do yeasts and apple trees. But in the 1970s, ecologists Robert MacArthur and E. O. Wilson noticed that these strategies tended to fall on either end of a continuum. Those at one end emphasized things like rapid growth, early maturation and prolific reproduction, while those at the opposite end took their time maturing and invested considerable resources in the production of only a handful of young. They termed those in the former category r-strategists, while those in the latter were called K-strategists (r and K refer to the algebraic formulas used to describe population dynamics – r refers to the growth rate of an organism, while K refers to the carrying capacity of the environment). Rats, rabbits and roaches are good examples of r-strategists, while elephants, humans and redwood trees are classic K-strategists. However, as time went on ecologists collected more data and determined that the real world can’t be explained in such a neat-and-tidy fashion. Organisms don’t form such a rigid dichotomy. The r/K framework has largely been discredited by modern scientists. But for the average nature-lover, the r/K framework can still be quite helpful. Some organisms do appear to reside at one end of the spectrum or the other, and that lets you draw conclusions and make predictions about their needs, strengths and weaknesses. There are, however, myriad exceptions. In fact, the sheer number of exceptions is part of the reason the framework was abandoned. But these exceptions can also prove instructive. Once again, we turn back to aspens. Aspens are clearly pioneer species, and most pioneer species tend to exhibit r-selected traits like rapid growth. Most also produce an abundance of offspring. But while aspen trees grow quickly, their seeds are a woefully inefficient mechanism for creating new aspens. They shouldn’t be very good at colonizing new habitats at all. How can we resolve this seeming paradox? How can such a poor colonizer become an effective pioneer? The answer lies, in part, in the episodic nature of disturbance that characterizes the North American habitats in which aspens thrive. And the primary agent of this disturbance – at least before humans colonized the New World – has long been wildfire. Note that wildfires are rarely one-off phenomena. They tend to occur repeatedly in a given area – areas in which aspens not-so-coincidentally thrive. It turns out that aspen-dominated forests require periodic wildfires to survive. Deprived of such, the aspens eventually die off, setting the stage for oaks and other late-successional species to take over. Aspens don’t burn as readily as the climax species lurking in the understory. So, when a fire tears through an aspen forest, it effectively “cleanses” the forest, by killing the invaders. This allows the aspens to continue to dominate the habitat. Sure, the fire will kill some aspen stems, but few live longer than 150 years or so anyway. And despite the burning fire above ground, the aspen’s shared root system remains alive underground, in relative safety. Once the fire has passed, the root system will just produce a new army of stems to replace any lost to the flames – just like it would do for those killed by predators, disease or fungi. Obviously, aspen seeds occasionally land inhospitable locations, where they germinate and grow. This represents their initial colonization of an area. But it doesn’t happen very often, so once an aspen organism establishes itself, it clings on tenaciously. In the ensuing years, decades and centuries, the aspen forest will endure these and other assaults, but it will always be lurking beneath the ground, ready to reclaim its territory. It’s an elegant solution. In a way, aspens create a whole new niche. They are pioneers who have already colonized the land before – they are serial pioneers. 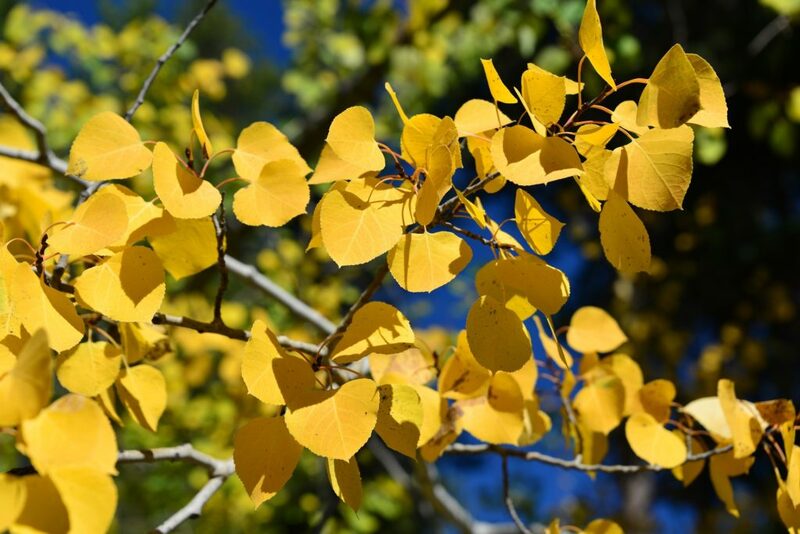 This strategy is not limited to aspens – they just provide one of the best examples of the phenomenon, as they respond to such disturbances with incredible vigor. Within two years of a stand-clearing event, some aspen colonies produce as many as 30,000 new shoots per acre, although 5,000 new shoots per acre represents a more typical effort. One particularly resilient aspen clone has achieved an absurd level of success. 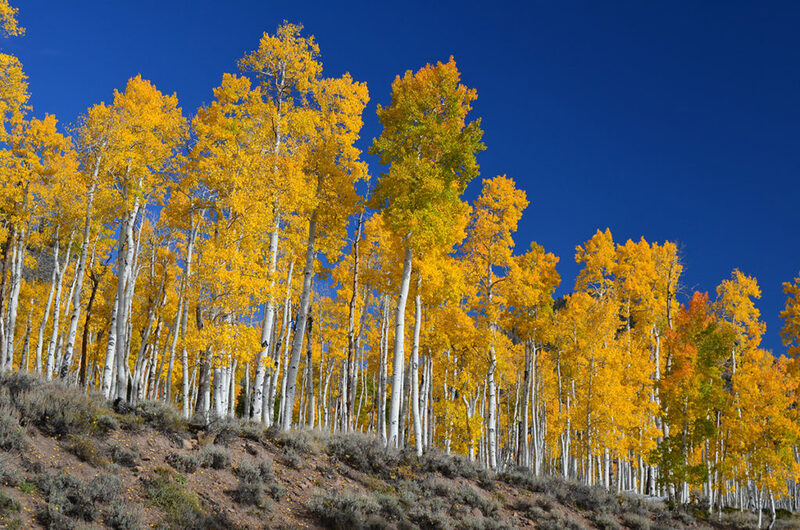 Nicknamed Pando, this 47,000-stem-strong clump of aspens has been growing in central Utah’s Fishlake National Forest for the last 80,000 years. None of the individual stems are anywhere near this old, but the root system has survived fires, pests and invaders that have threatened it through the ages. To get your head wrapped around Pando’s age, consider that when “he” (Pando is a male plant) first emerged from a tiny seed, at least three different human relatives of the genus Homo still walked the earth. Our own species – Homo sapiens – had already appeared (although we had not yet colonized North America, much less begun growing our own crops), but Neanderthals (Homo neanderthalensis) were still around, as was Homo erectus. And some evidence suggests that Pando may be much older than this – it turns out that 80,000 years is a conservative estimate of the ancient tree’s age. Unfortunately, Pando has fallen on tough times and appears to be dying off. In this context, this means that new stems are not being produced quickly enough to offset the colony’s losses. The root system cannot live without enough stems to produce the sugars the organism needs to survive. Important though the roots are, they cannot produce the food they need. Current fire-suppression strategies may be part of the reason Pando is struggling, but the decline is likely due to a combination of complex factors – the lack of fire is simply one of the most obvious. 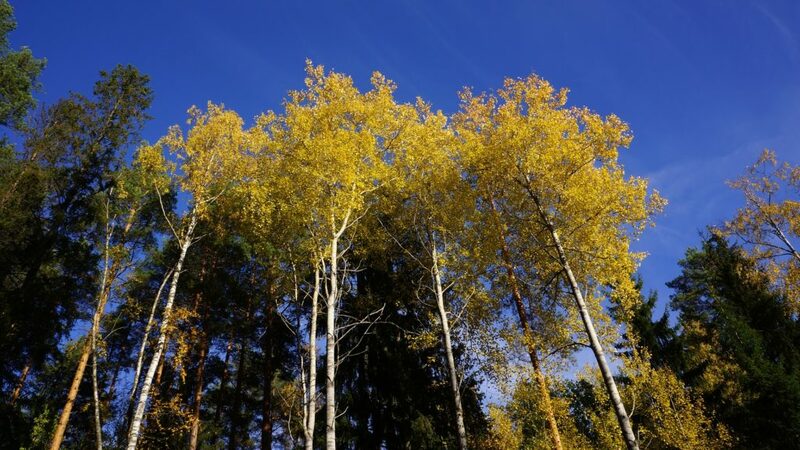 Actions to save Pando are underway, and some portions of it have been clear-cut in an effort to trigger the root system into producing new sprouts. Should he perish, it may be some time before a fire clears the area and a tiny aspen seed manages to gain purchase in the area to start the process anew.